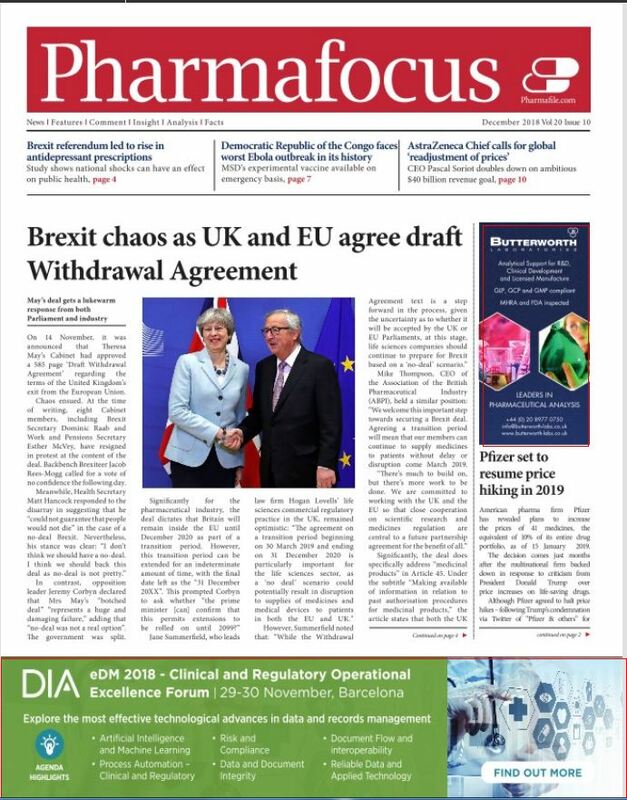 Home > The December issue of Pharmafocus is available to read online now! Featuring insight into the treatment and R&D climate for mesothelioma, full-length features on how tech is galvanising precision medicine and how controlled substances could transform the treatment of mental health, and an annual round-up featuring GIlead, Mundipharma and more, check out the December issue of Pharmafocus now! Brexit continues to dominate the headlines inside and outside the industry, but for our final issue of 2018, we have a slew of content and news to round out the year. Among them, Mesothelioma.net provides an insight into the latest challenges and advancements in tackling the deadly cancer , and we have a full-length feature  on how the latest technological innovations such as artificial intelligence are helping to galvanise our approaches to precision medicine, whether that is informing the earliest stages of drug discovery or calculating the optimum dosage to deliver to patients. To celebrate the end of another year, we also have an annual round-up feature  including commentary from Gilead, Mundipharma, Eisai and more, each discussing their key moments of 2018, insight on developing trends, and their predictions for next year. And in our monthly Working Life , we speak to Kai Gait, GSK’s Senior Global Digital Director, on his path through the industry; he recalls the bloom of his love of tech, and discusses its ever-growing importance in the industry. From us at Pharmafocus, have a great holiday period and New Year, and we’ll see you in 2019 to bring you all the latest in the industry as it happens.